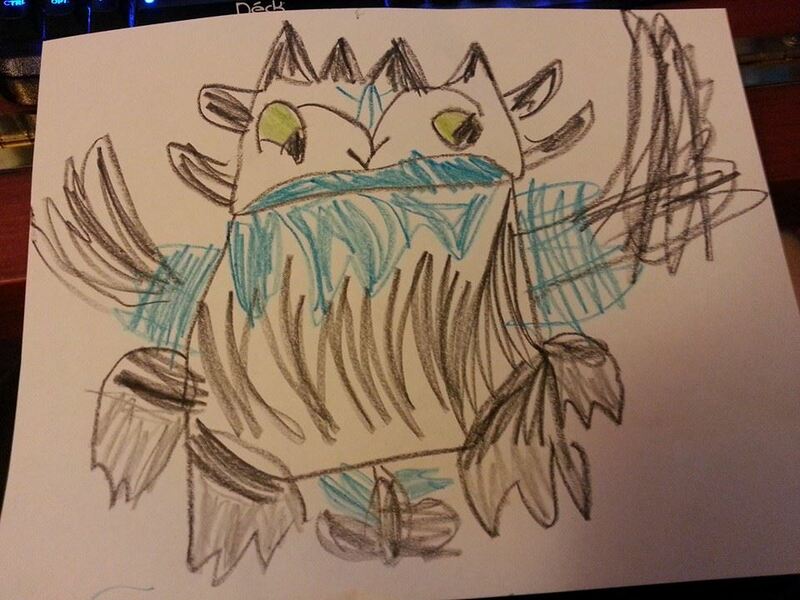 A Night Fury dragon drawn by my four year old daughter. This is the story of a boy and his dragon. No. Wait, scratch that. This is the story of a girl who is about to turn five. A girl who loves princesses, long dresses, painted nails, the arts, and a dragon named Toothless. Toothless is featured in over a dozen books, two movies, even an animated series. She adores everything that features this dragon, so it comes as no surprise that she wants her upcoming birthday party theme to center around this icon. The How to Train Your Dragon franchise conveys something that speaks to so many children (and adults) so clearly. It speaks about a love between a boy and his best friend. Love applies to all genders, does it not? It also relays a story of friendship, trust, family, death and the art of problem solving. The latest movie recently won a Golden Globe, and it’s been nominated for an Oscar. So you can imagine the frustration of this particular parent finding that according to retailers across the globe that 1) Items from this franchise are currently out of stock with no sign of it coming into stock, 2) retailers who do carry it decree that dragons are for boys only, and 3) girls will only express interest in the female characters of any given series, so we’re not going to bother making anything gender neutral. Obviously, this isn’t limited to dragons. This actually applies to many other characters. Want to host a party featuring a certain boy explorer and his jaguar companion? Well, if you have girls coming, retailers suggest that it’s best to include his younger female cousin and her pet monkey, because only boys can play here. Want to have a theme featuring kid pirates that go against a hooked captain that has been featured in stories for over a century? Chances are, you’re going to have to wade through hopelessly gender stereotyped favors and toys geared only toward boys. How about a party featuring singing princesses and their animated sidekicks for your son? Surrreeee, you can have a party if you omit the princesses and stick with the sidekicks. Let’s not rock the boat though, we have an image to maintain! While I, for one, am frustrated with the fact that these franchises are completely neglecting 50% of a potential market, I know I’m not alone. Across the globe, there are groups working to convince corporations to stop gender marketing, and let kids choose what to play with. One group, ‘Let Toys Be Toys’ over in the United Kingdom has worked successfully to help remove gender marketing from fourteen different retailers and counting. Toys R Us franchises in Sweden collaborated with Top Toy to completely remove gender stereotypes in 2012. Catalogues featured boys playing with dolls, girls playing with archery sets, and both cooking together in play kitchens. With this level of success in Europe, the casual shopper would be led to believe that here in 2015, retailers in the United States were with the progressive program. Unfortunately, that isn’t the case. Just walk into any toy store at the mall or your nearest Big Box store to see for yourself. It’s no better in party supply shops or online. Even Etsy segregates by gender. If the big name chains and websites are to be believed, “Girls can’t possibly like dragons, safaris, or pirates. Nor are boys allowed to like any characters that sing, unless it’s a talking snowman or a prince trying to woo a princess.” With this sort of line of thinking, ending gender marketing in the US won’t happen any time soon. What can we do as disgruntled parents when corporations refuse to end the gender marketing? While lobbying to end gender marketing has not been successful here in the US, we as consumers can keep pushing to make that change. Word of mouth, phone calls, petitions and letters are all wonderful ways to work towards gender equality, certainly. But what about groups that blatantly ignore consumers and demographics? What then? Let Toys Be Toys suggests that consumers should not be afraid to take their business elsewhere. Further, consumers should explain exactly why they are leaving. It’s a little less stressful than organizing a boycott, certainly. But for that little four year old who still wants her dragon, and that little 5 year old boy who wants to sing like Elsa, what about them? I’d like to offer a couple of suggestions. First, let’s break the gender stereotypes. Draw, sew, or even buy that dragon (or gown, doll or toy set) from businesses that don’t gender market. Let them sing to their heart’s content, or soar on dragon’s wings. Create your own theme and party ideas utilizing those beloved characters. Utilize the art of playing make-believe with your child, and see what kind of scenario unfolds. I’d like to share one successful non-gender marketed story. Last month, my daughter’s preschool had a Frozen Wonderland party that was well attended by both boys and girls. They did not market the event to a particular gender set at all. Instead, they featured all-inclusive activities. At the event, the kids built snowman, explored a maze decorated with bubbles, glitter and fluffy fake snow. Kids feasted on popcorn and shaved ice before gathering to sing songs together from the movie. It was a wonderful event, and the kids are still talking about it weeks later. It’s my hope that my daughter won’t have to be boxed in by gender marketing as she gets older. To promise her that she too can have her own dragon is my first step. To make our voices heard comes next. I hope soon, those retailers take steps to end gender marketing in favor of a more inclusive strategy. Jill Redding is a mother and blogger at PianissAmma.